Executive Chef Joseph Gillard at Napa Valley Grille appreciates farmers. Raised on a 40-acre farm in Michigan with goats, chickens, rabbits, pigs, pheasants and cows, his family had a large vegetable garden and market stand to provide sustenance and income. At the age of five, he became infatuated with food while watching Julia Childs on television. He declared to his mother that one day he would be a chef. At ten, he read his favorite television star’s cookbook, Mastering the Art of French Cooking. Classes in culinary training prepared him for local jobs in restaurants. Later, he moved to Los Angeles and worked at Joachim Splichal’s Pinot Bistro in Studio City. In 2007, he joined Napa Valley Grille as executive chef. His knowledge about farming and appreciation of locally grown ingredients is seen in his signature wine country menu that incorporates fresh produce and artisanal products. Why drive up to Napa or Sonoma to experience an epicurean adventure when you can have a similar experience in Los Angeles. I’ve been to Napa Valley Grille four times and each visit has been extremely satisfying. On our last adventure, our server Patrick educated us on the regions, varietal types, scents and flavors of various wines by pairing them with several dishes. As we looked over the menu, a basket of fresh bread and tomato tapenade arrived. The bright red spread consisted on roasted tomatoes, garlic, shallots and a sweet and spicy chili sauce. It had an exciting little kick to it. Patrick paired our scallop appetizer with a crisp, sweet smelling Peju Sauvignon Blanc. The delicate tempura medallions were placed on top of an exquisite sweet corn and persimmon succotash, with micro bulls blood greens. Next, we tried the Artichoke humus flatbread and summer asparagus salad with white and green asparagus spears on a bed on greens with a sunny side egg on top. When I pierced the yolk it spilled onto the roasted asparagus and created an ambrosial taste sensation. Paired with a Stags Leap Chardonnay that was full body and offered a slight vanilla flavor taste. For my entrée, I selected the seared chicken breast with Moroccan spiced eggplant, red spinach and charmoula marinade yogurt. Patrick served a glass of Chateau Montelena Riesling, an ideal companion for a slightly spicy dish. Chef Gillard has created a Community Supported Agriculture (CSA) program that allows Angelenos to develop a stronger relationship with California farmers. He offers customers the opportunity to purchase exceptional produce from the farmers he works with daily. Every Wednesday, patrons pick up a box of produce at Napa Valley Grille, along with cooking tips and recipe cards from Gillard. A sample harvest CSA basket could be ultra-fresh butter lettuce, acorn squash, watermelon radish, purple carrots, blood oranges, apple pears and baby zucchini. 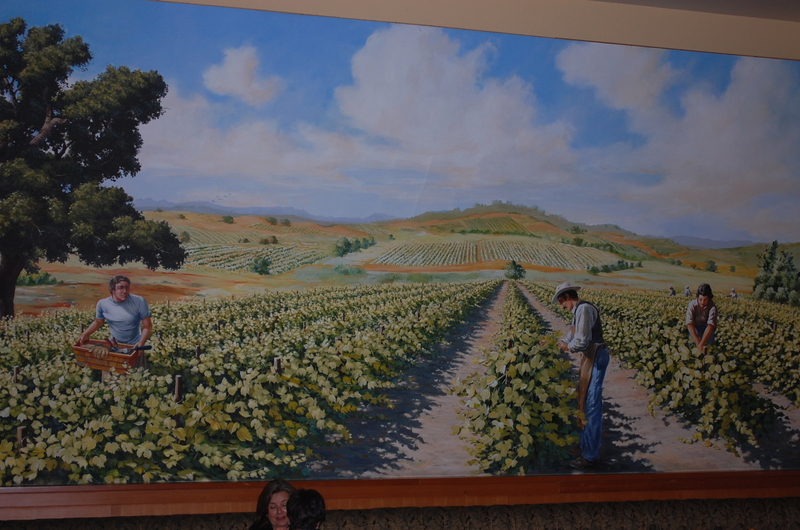 In addition, once a year, CSA subscribers meet at Napa Valley Grille for a celebratory dinner. Costs range, depending on a 13-week season, from $455-520 or a full year is $1,900. Those interested in joining the CSA program can inquire by calling (310)824-3322. On my next visit, I plan to attend the Jazz brunch on Sundays where UCLA college students perform, while patrons order wine country breakfast small plates for under $6. 1100 Glendon Ave, Westwood (310)824-3322.